Product information "SAMSUNG RFG23UERBP 3 DOOR AMERICAN A+ ICE/WATER BLACK"
This ultra stylish Samsung RFG23UEBP1 American-style Fridge Freezer is crafted with elegance and convenience for supreme food storing. This large fridge freezer is built with thin wall insulation technology allowing more room for food storage. There is a spacious 450 litre fridge capacity and a generous 207 litre capacity for frozen goods. The frost-free refrigerator is equipped with 4 safety glass shelves for easy and flexible food organisation. The 2 salad crispers preserve vitamins and nutrients in your fruit and vegetables. The RFG-23UEBP1 features additional door storage for your drinks, diaries and delicates. There's even a full width CoolSelect pantry drawer, the easy sliding drawer can be set at 3 different temperatures for optimised freshness. The advanced multiflow cooling technology circulates cool air through shelf outlets, evenly cooling throughout and rapidly restoring optimum temperature after the door has been opened. Like a true American-style refrigerator it is built with a water and ice dispenser. You can enjoy a cool glass of water with either cubed ice or crushed ice, at the touch of a button! The water filter system ensures the RFG-23-UEBP1 refrigerator dispenses fresh water and ice so you don't have to fill your fridge with bottled water anymore! 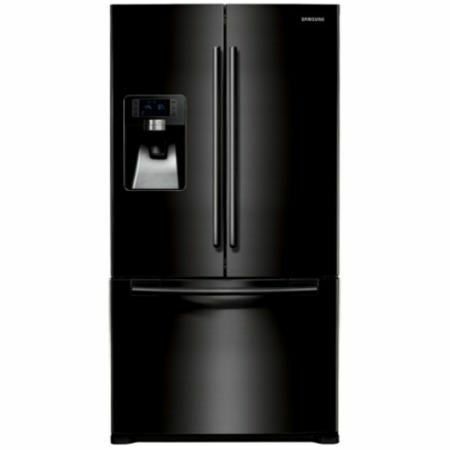 Related links to "SAMSUNG RFG23UERBP 3 DOOR AMERICAN A+ ICE/WATER BLACK"
Customer review for "SAMSUNG RFG23UERBP 3 DOOR AMERICAN A+ ICE/WATER BLACK"